No longer the sluggish, eutrophic, apparently lifeless ditch. A bank-high torrent has flushed activity into it like steady rain to a recently drilled field. Suddenly the scum-clad becomes the pristine and, to the piscean stomach, comes hunger. The tinge of colour suggestive of feeding fish, combined with swift narrow runs flanked at bends and obstructions by gentle glides, slacks and tiny whirling depressions easing through the creases and slowly, imperceptibly, diminishing to nothing, had raised expectation to unprecented levels. Over-excited surface-bursting fish remain rare, but they are now occasional, while confidence and competition for a morsel in the chilling, constant curvature of the channel abound. A week ago, the tiny River Leam sought to issue forth all its Chub in one magnificent morning. Fish were so ravenous as to tear-off with large chunks of crust before the anglers' contact with them could be affirmed. Rod tips pulled round barbel like and clutches squealed in otherwise rural tranquility. Eight fish between 2lbs 1oz and a touch over 3lbs came to the net in a couple of hectic hours while a match angler harvested eleven of these aquatic omnivores for a catch of over 27lbs the following day. 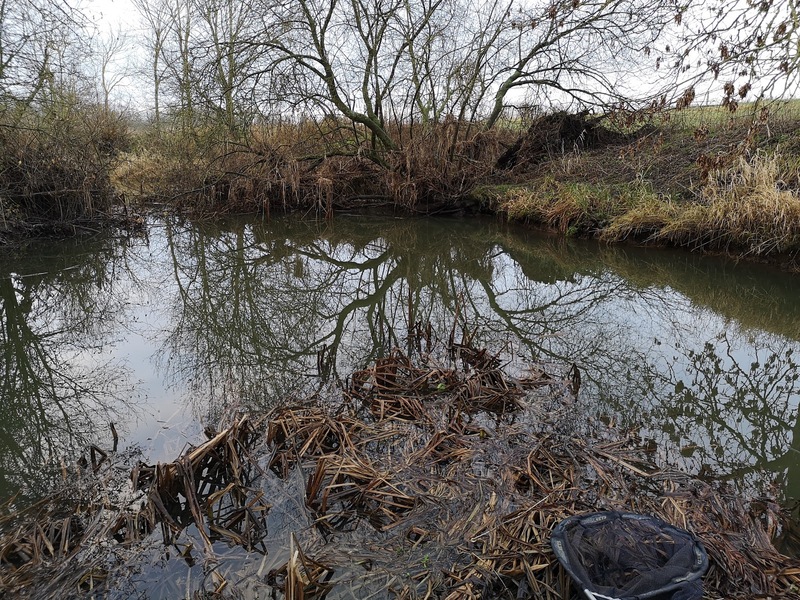 Those 19 fish averaged 2lbs 6ozs, a fair reflection of the state of this oft misunderstood stream, it's potential shrouded by a paucity of suitable conditions, and yet it has recently been said this is "A River in Decline". So the era when global warming manifests physically in the feast and famine of fish is firmly established. Clear or coloured; low or threatening the fields; stagnating or vigorously flowing. Such are the extreme phases of the midland river in the 21st Century. A time when partly forced predation combined with the above climatic influences is turning, or has turned, our fish to increasingly nocturnal behaviour. One wonders whether angling clubs of the future will need floodlights. In a recent exchange with that expert Specimen fish pursuer James Denison, we were agreed that we can live with the natural balance that otters will ultimately create once back to a population balanced with their environment but when it comes to the invasive signal crayfish and ever increasing displaced cormorants there is no obvious solution, and, as with all these things, the answer will be considered long after the piscatorial horse has bolted. In New Zealand there is a purge on non-native fauna but where would we start, with so many established former invaders and introducees that one wonders what would be left if they were removed from the landscape and how that loss would now affect the indigenous species. Perhaps rewilding, with the reintroduction of long-lost top predators and landscape-shaping species, would impact these flourishing animals the dissipation of some of which is now ingrained in our culture. The rabbit for instance. No. It is far too complex to contemplate a solution but, one thing is certain, pot-shotting the odd fish-eating bird changes nothing. If it is man that has changed the balance of nature then it is men that have to live with it. 'Bumped into Zed-hunter extraordinaire Mick Newey on a new stretch of the Leam the Bloggers' Syndicate is trialling just after the aforementioned floods, and prior to the colour completely falling away. Dressed resplendently as always he leapfrogged my swim at the very moment I had my best twang on the new wand, on its first outing. Rather than plough the usual chub-likely crease, the day was to have been one of experimentation. 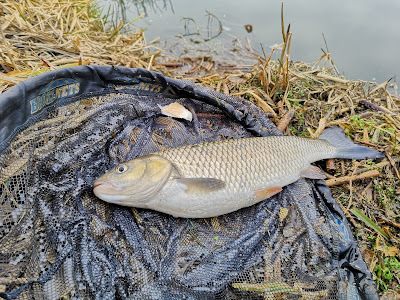 The mini method feeder idea recently tested for big canal roach seemed, on the face of it, to be equally suitable for small stream, smaller species. So arriving at the first swim, a bag of 'liquidised' at the ready, a long, steady glide around three feet deep looked ideal - nothing. Working upstream, any fish facing away from me, a deeper hole concealed in trees caught the eye. Tap, tap, quiver, twang and a handful of Chublet was eased back into the protected shallows bankside. ...And so it continued, until we met. 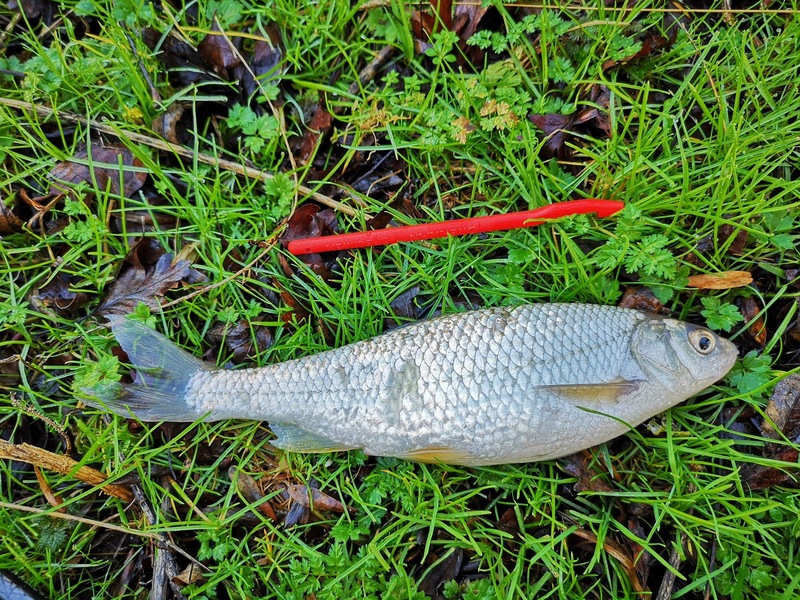 The bite was struck sharply and a sparklingly silver fish twirled in frantic action in the clearing water. It had the look of a battery powered silver bream but of course it couldn't be. Soon the net slipped under the biggest dace I had ever seen in the pearlescent-clad flesh. Now when I say biggest ever, the excitement must be tempered by the fact that I have never seen one over five ounces, but nevertheless the fact remains. Mick felt it could go seven or eight ounces and I underestimated, match angler style, the fish ultimately weighed-in at seven ounces four drams. Perhaps a feeble P.B., but it was one, and that would do me, and, for me at least, that moment was enough to confirm the potential of the water. Further swims produced other previous P.B.-shaking dace. All from steady, shaded glides over gravel. The 'mini-method' displayed an additional virtue that could, just possibly, set it on its way to being a standard technique in the F, F & F armoury; it enabled the swim to be searched without risking over-feeding the wrong area and wrecking it before casting in. The rig could be flicked around various spots until the fish were found and then the feed built-up cast by cast, and, by increasing the stop shot size, casting weight could be adjusted neatly too. 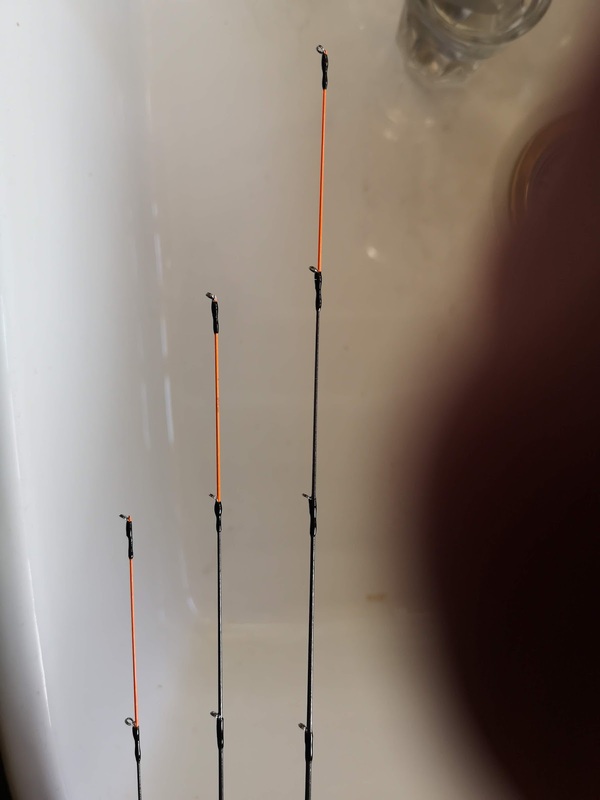 Certainly with more flow and depth on the stream would take float fishing as well but it shows signs of being a tactic to employ with some regularity, and far less crude on casting than a standard feeder set-up, however tiny 'they' might make them. That said, it is perhaps time to confess that the past as a 95% float angler has been completely turned on its historical, not to say "hysterical", head in this second, and last, wave of angling submersion. It didn't take long for the taxed and diminishing grey matter to twig that the effort and, let's be frank, discomfort of float fishing for bigger fish really is not worth it all that often. Great read that George !!! that little coil feeder is great, super light and hardly makes a disturbance on the water, might get some myself. I have to admit it is very easy to slip into that blame game, but you are ultimately right, it'll change nothing. As much as it sounds terrible the new Apex predators will have to find a balance or face an uncertain future. 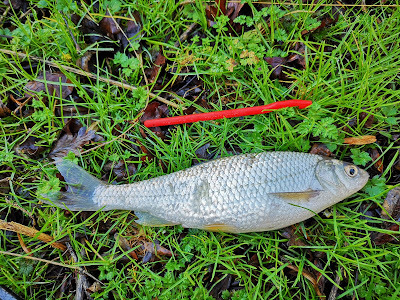 As for the Chub fishing, it sounds like great fun and it's the sort of fishing I love ! Keep at it, those Dace will only get bigger now! OK Billy I'll search that out. Sounds a staggering fish! Thanks for the pointer. Hi George.Michel Townsend will know .the waters 25 minutes from home sos will have a talk to the lads in tackle shop .the guy won a drennan fish of the week . Ah yes! This is the guy who caught it carp fishing isn't it? Greetings from germany. I visited your blog after i saw your video on youtube. Keeping it up, its fantastic! Is the lift bite method from the video used in Deutschland?